A pivot table is a program tool that allows you to reorganize and summarize selected columns and rows of data in a spreadsheet or database table to obtain a desired report. A pivot table doesn't actually change the spreadsheet or database itself. A pivot table allows you to extract the significance from a large, detailed data set, thus turning "data overflow" into meaningful reports. 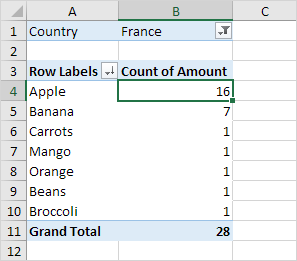 Use a pivot table to build a list of unique values. 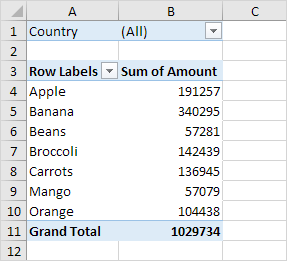 Because pivot tables summarize data, they can be used to find unique values in a field. This is a good way to quickly see all the values that appear in a field and also find typos, and other inconsistencies. 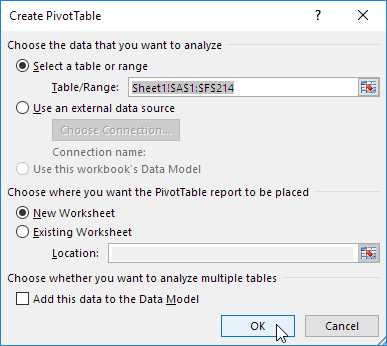 Pivot tables accomplish this task by using "Values Areas". The Values area displays the data (values) that we want to summarize in our pivot table report. 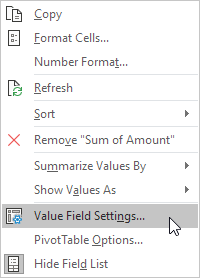 When you drag a field into the Values area, the pivot table will automatically sum or count the data in that field. If the data in the field contains numbers, then the sum will be calculated. Our data set consists of 213 records and 6 fields. 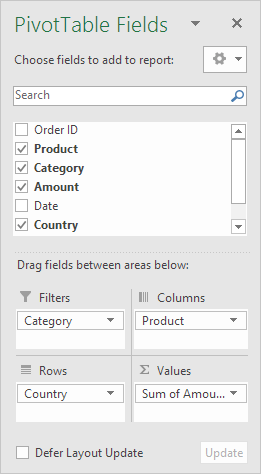 Order ID, Product, Category, Amount, Date and Country. 2. On the Insert tab, in the Tables group, click PivotTable. The PivotTable Fields pane appears. To get the total amount exported of each product, drag the following fields to the different areas. 1. Product field to the Rows area. 3. Country field to the Filters area. Below you can find the pivot table. Bananas are our main export product. That's how easy pivot tables can be! 1. 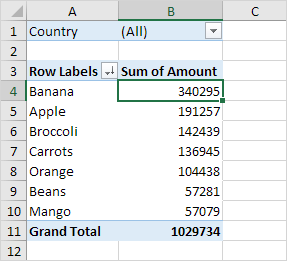 Click any cell inside the Sum of Amount column. 2. 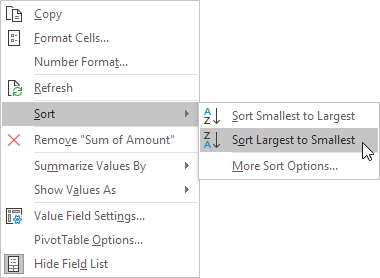 Right click and click on Sort, Sort Largest to Smallest. 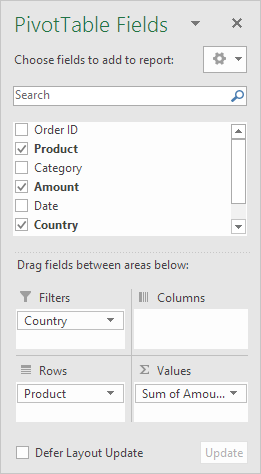 Because we added the Country field to the Filters area, we can filter this pivot table by Country. For example, which products do we export the most to France? Note: you can use the standard filter (triangle next to Row Labels) to only show the amounts of specific products. 2. Right click and click on Value Field Settings. Result. 16 out of the 28 orders to France were 'Apple' orders. 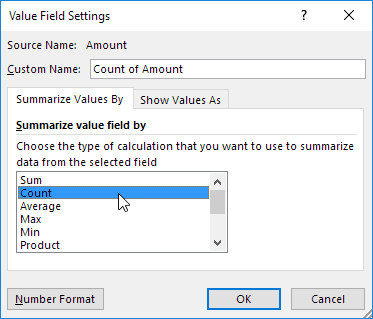 If you drag a field to the Rows area and Columns area, you can create a two-dimensional pivot table. First, insert a pivot table. 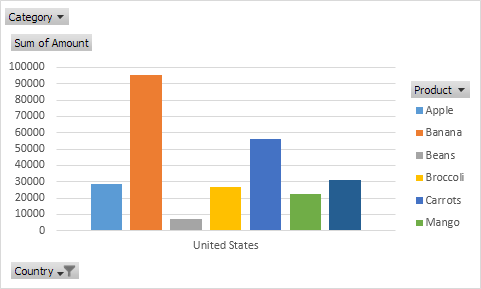 Next, to get the total amount exported to each country, of each product, drag the following fields to the different areas. 2. Product field to the Columns area. 4. Category field to the Filters area.